How we started, what we built, and what we learned building our first email design system at Stack Overflow. Design systems for the web have become popular as companies realized the need to strengthen the design of their products to compete. But what exactly is a design system and could one work for email? 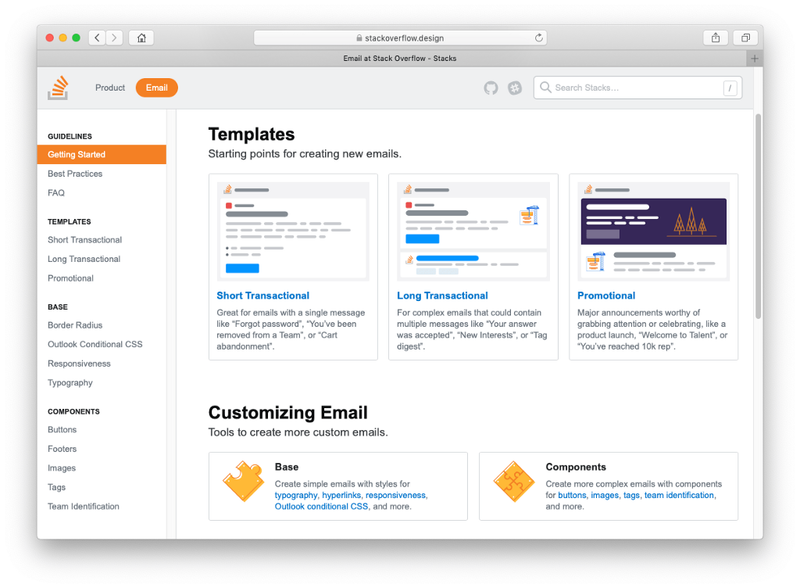 At Stack Overflow, we’ve been building our email design system for the past few months and thinking about how to scale our email design process across multiple teams. So whether you’re just documenting your most-used code snippets or getting ready to build an email design system, I’d like to share a few lessons we’ve learned about email design systems so far. The definition of a design system varies, but I’m going with this one. Design systems for the web have become popular as companies realized the need to strengthen the design of their products to compete. A design system helps a team form a shared mental model and codify common, tested patterns to deliver a consistent user experience. Think of it as a lightweight scaffolding and guidelines to design with, rather than creating stuff from scratch or plain sight. It cuts down on the need for bespoke design, which is slow, inconsistent, hard to test, and increasingly difficult to maintain over time. As a team grows and work volume increases, it gets harder to maintain alignment and consistency. Bespoke design simply doesn’t scale, and that’s where a design system helps. An email design system either applies these concepts to HTML emails, or in our case, adds HTML emails to an existing design system. Wait! Hold up… why does Stack Overflow even need a design system for emails? This resulted in a bunch of inconsistently designed emails that fell apart in most email clients. For a company that sends four million emails a week, that’s a problem. At best, a broken email contributes to the broken windows theory (“if this email’s broken, I wonder what else is…”) and erodes someone’s trust in us. At worst, it means someone can’t complete a task. When we put more effort into an email project, the process was slow, designs were inconsistent, and code was hard to test. Without a design system, everything was bespoke design. Bespoke design doesn’t scale. Our team didn’t have anyone dedicated entirely to email, so we had to find a way to allow more people to build consistently-designed, properly-rendered email. We felt the pain of not having a way for folks to build consistently designed, properly rendered email at scale and identified an email design system as a solution to our problem. If you don’t feel a similar pain, maybe you don’t need a design system. The Design System Decision Tree is a good read here. We started with whatever spare time we had between projects. However, our initial efforts were scattered and progress was inconsistent. Whenever we started gaining momentum, we’d get pulled away. We didn’t have regular check-ins or a roadmap. After a while, we learned that our design system would need to be an official project or the company would just keep pushing to ship product work faster instead of building the infrastructure for a better future. Time: We spend a lot of time solving the same problems over and over again. An email design system will speed us up, empower more people to build email, and free us up to work on other things. Money: Our email doesn’t bring in revenue directly, but it drives platform adoption, which does tie to revenue. An email design system helps us put our best foot forward and also eliminates the need to outsource or hire someone dedicated to email. And there’s always the “Take everyone’s salaries and multiply that by the hours spent and here’s how much a typical email project costs” argument. Education: Only a few people on the team are experienced in email. A design system’s documentation educates everyone else on the team and helps when onboarding new team members. Our pitch went something like that. Yours may vary. It helps to think about what your boss (or your boss’s boss) cares about. They might not care if a button looks funky in Outlook, but they might care about the extra five hours the team spent QA’ing that email last week or lost sales caused by a button that wasn’t clickable. Ultimately Stack Overflow recognized our design system as a sanctioned project. We allotted it regular time and started having weekly check-ins. While we worked on our pitch described above, we started planning our email design system. It’s tempting to look at other design systems with elaborate marketing sites containing detailed documentation and organized code for every conceivable component bundled up in an npm package with a build process. It can be paralyzing to consider all that on day one. We reminded ourselves that these other design systems were the product of months of hard work. We started small. Like, really small. Like, in a blank Google Doc with editing rights enabled for everyone. We invited folks from all over the company to discuss what email components they use most and what questions they have. Engineering, product managers, marketing… we even got legal involved. Starting in a Google Doc lowered the barrier to entry and allowed everyone to brainstorm with us without configuring any software or knowing much about design or code. Hearing everyone’s voice at the beginning showed how everyone thinks about email differently. Only after this initial discovery did we start thinking about design or code. When it’s time to start making the actual design system and documentation site, I don’t want to be overly prescriptive since every product and team is unique. If you’ve read this far, you may already have some ideas for your own design system. That’s great! The only advice I have is to launch as early as possible. Forget those other design systems you saw with 40 components and a 10 page wiki on how everything works. We launched our design system with only basic typography styles, responsive images, one button style, and a responsive-aware wrapper (the stuff we identified from the Google doc above). That’s it! Documentation is the most important part of a design system. There, I said it. A design system lives and dies by its documentation. We designed an email template specifically for our Stack Overflow for Teams product, but we didn’t document how it should be used. Our documentation just said “use for teams.” Imagine my reaction when I got an email from our own IT Department who’d used the template to send a company-wide email about our passwords. They interpreted “teams” as “my team name on the org chart.” A perfectly valid interpretation since we skimped on the template’s documentation. Oops!! Incomplete or outdated documentation can lead people to using patterns for the wrong reasons. If something’s not documented at all, it may as well not exist and you run the risk of people writing new but duplicate code. Good documentation helps promote new patterns, reduce the need to write new code, and makes implementation easy with code examples and guidelines. It’s worth investing time in developing practices that help you keep updated documentation. When building design systems, get into habit of documenting early. You’re building a system and that cannot work if the system is you. These days we document components as we add them. There’s no “Oh I’ll just document this later” going on. We still have a lot to do (we still don’t have a proper roadmap), but we’re already seeing our email design system fulfilling its purpose. One thing I love about this industry is how we openly share stories like this about our work. That’s why I wanted to talk through how we approached our email design system, the decisions we made, and how we’ve been working through the difficulties we’ve encountered. If I can leave you with some parting words: Be inclusive. Welcome people into your work. Don’t overcomplicate things. Open Source if you can. #emailgeeks have a lot to share. We’ll all be a better community for it. If you’re interested in chatting about your experience (and struggles), ping me on Twitter or message me on email geeks chat! Special thanks to Piper, balpha, Aaron, Josh, Courtny, Elaine, and Kristina for help with our email design system and this article. Design Systems for email: bringing order to the chaos was originally published in UX Collective on Medium, where people are continuing the conversation by highlighting and responding to this story. Previous articleAre you going to be the first designer at a start-up?